We install fiberglass pools, liner pools and above ground swimming pools in Sumter, SC. We also repair most types of pools, including some gunite. Our services include new pool installations, whether inground or above ground, removal, new liners, pumps, filters, salt systems, swimming pool cleanings and much more. So give us a call, send us a text, or send us an email for all of your Sumter swimming pool needs or questions. Experience is the key to having a fiberglass pool last a life time. We are highly trained and experienced with the installation of pools, especially fiberglass. 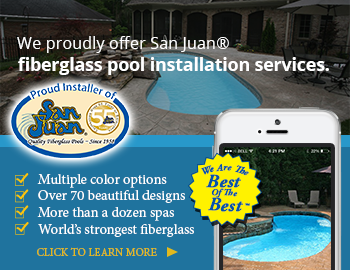 San Juan is the most experienced fiberglass company in the country, with 58 years experience in the fiberglass pool industry. Pelican Pool Service has thirteen years of experience, so we know how to install a swimming pool properly in Sumter, SC, so your pool should last a lifetime. So, JUST SIT BACK AND ENJOY!